Mathematical Proofs Without Words: What are they? 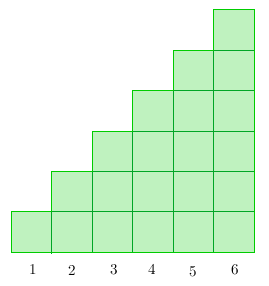 In Proof of the Sum of Square Numbers, I have mentioned about proof without words. Some of you are probably wondering what they are, so I will discuss in detail. Proof without words are diagrams or pictures that help readers see why a particular statement is true even without accompanying explanations. One example is a classic proof of the Pythagorean theorem shown in the first figure. In the example, we have two congruent squares. There are four congruent right triangles occupying portions of both squares. 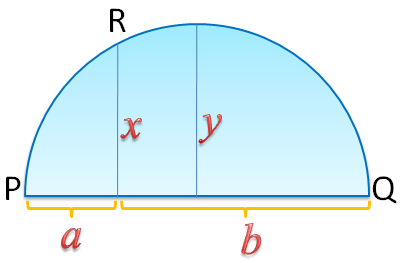 It is clear that the total area occupied by the triangles in the first diagram is equal to the total area occupied by the four triangles in the second diagram. If the occupied areas on both squares are equal, it follows that the unoccupied areas are also equal (Why?). Therefore, . Now, that proves the Pythagorean theorem. The formal proof of the equation can be demonstrated using mathematical induction. I am currently reading a collection of Proofs without Words by Roger Nelsen. You may want to check it out. Last February, we have used area to prove the Arithmetic Mean – Geometric Mean Inequality (AM-GM Inequality). In this post, we show a simpler proof. We have discussed how Gauss was able to devise a clever way to add the first positive integers at a very young age in a few minutes. We generalized his method and have also seen the link between the sum and the area of a triangle. In both discussions, we have shown that the sum of the first positive integers is . In this post, we discuss another geometric proof of the problem above. We start with a specific case adding the first positive integers, and the proceed to the general case.